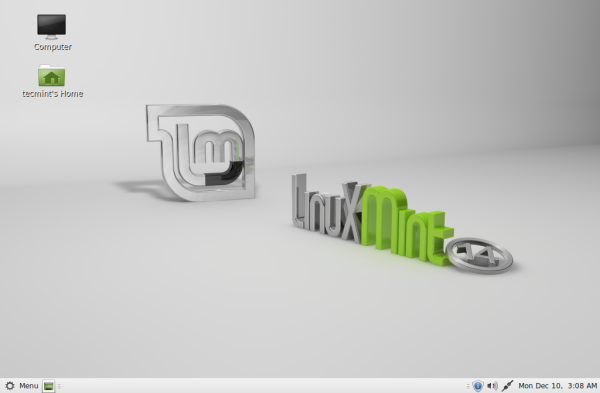 Linux Mint is an Ubuntu based distribution and one of the most loved and used Linux distribution these days. It provides a complete new experience for users which includes browser plugins, media codecs, support for DVD playback, Java and other desktop components being most of it desktop oriented. On May 31st 2014 official Linux Mint developers announced on their blog, that the final version of Linux Mint 17, codename Qiana with both versions available for download, Cinnamon and Mate desktop, with an official support until 2019 – same as its mother distribution Ubuntu 14.04. A new Update Manager improved version. MDM 1.6 Login Screen with HiDPI support and recovery mode. An improved Software Sources configuration tool. Cinnamon 2.2 with better looking settings. A new collection of backgrounds. Linux Mint future versions releases with the same package base until 2016. No support for Nvidia Optimus graphics chipsets yet (minimal support is ensured by nvidia-prime package). 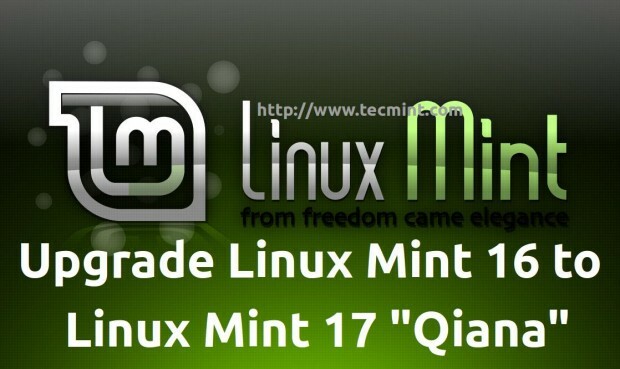 This tutorial will focus on how to upgrade your current version of Linux Mint 16 Petra to new released version of Linux Mint 17 Qiana. For a clean installation without an upgrade process and other useful information download DVD ISO images using the following links. For Linux Mint 17 “Qiana” Cinnamon 32-bit and 64-bit – http://blog.linuxmint.com/?p=2626. For Linux Mint 17 “Qiana” Mate 32-bit and 64-bit – http://blog.linuxmint.com/?p=2627. Warning : Before you attempt to start the upgrade process make sure that you made a backup of your important data in case something goes wrong and the system breaks. 1. Before you start, you can check your Linux Mint version by opening a Terminal and run the following commands. 2. On the second step make sure you create a backup copy of your system sources. 3. Now it’s time to start editing Linux Mint software list for ‘apt-get‘ to start and pull software packages from new repositories locations by opening and editing ‘/etc/apt/sources.list.d/official-package-repositories.list‘ file and replace “petra” with “qiana” and “saucy” with “trusty” on all lines. 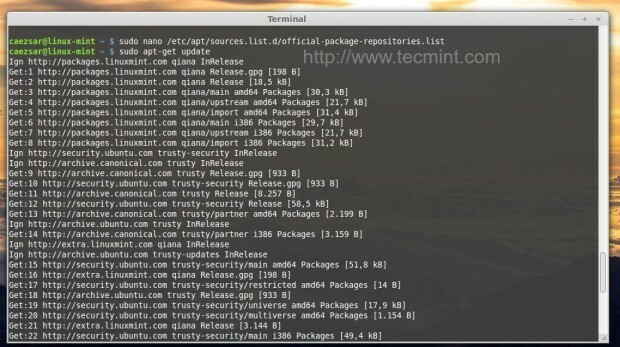 Also if you have Source and Getdeb Repositories enabled make sure that the names are changed on ‘/etc/apt/sources.list.d/official-source-repositories.list‘ and ‘/etc/apt/sources.list.d/getdeb.list‘ too. 4. 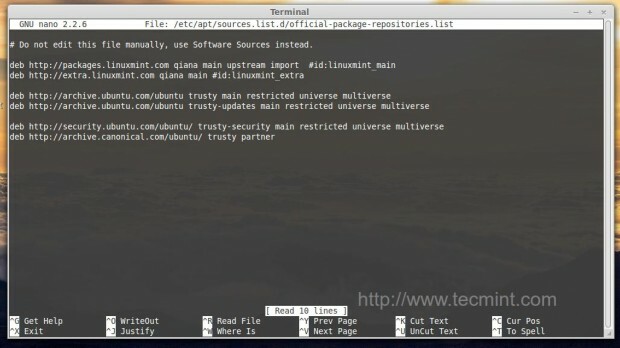 Another way of editing those file is by using sed command in terminal. 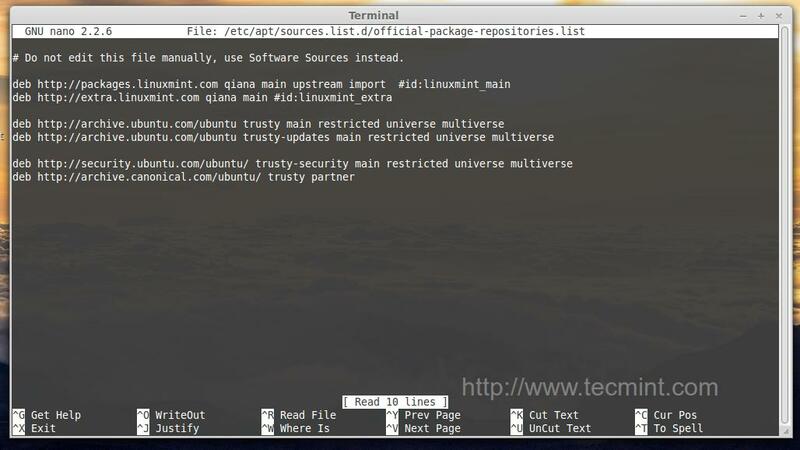 NOTE: If you have other Repositories or PPA enabled on you system visit their official page and make sure they provide packages for Ubuntu 14.04 or Linux Mint 17, else edit or remove them now from your system. 5. 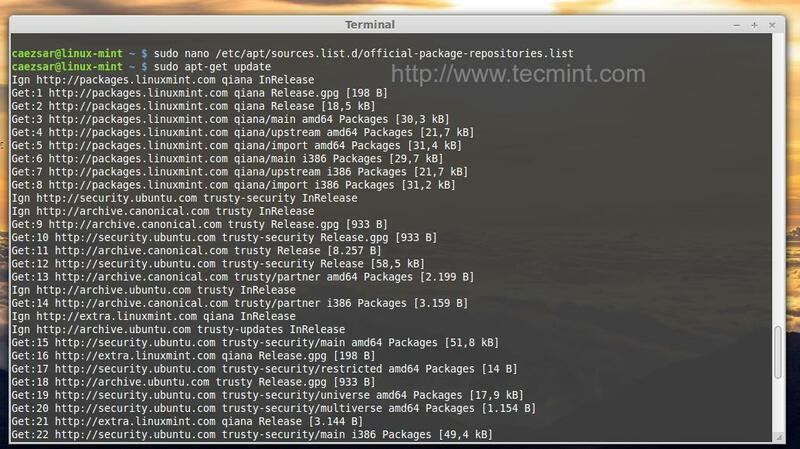 After editing Repositories list files using one of the above methods start the upgrade process by running a series of commands. Depending on your system resources and Internet speed the upgrade process can take a while and the update manager will ask you a series of questions regarding configuration files and services restart. 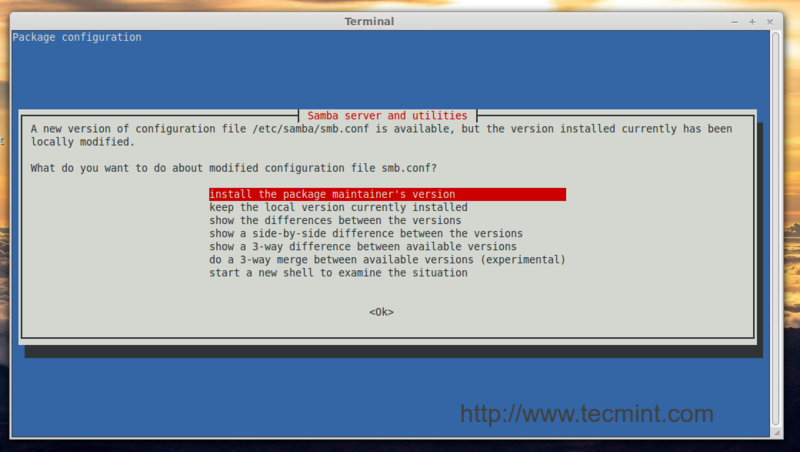 Answer ‘Yes‘ on all questions and select ‘Install‘ the package maintainer’s version on all configuration files. 6. After the Upgrade process finishes reboot your system and you will have the new version of Linux Mint installed on your box. 7. 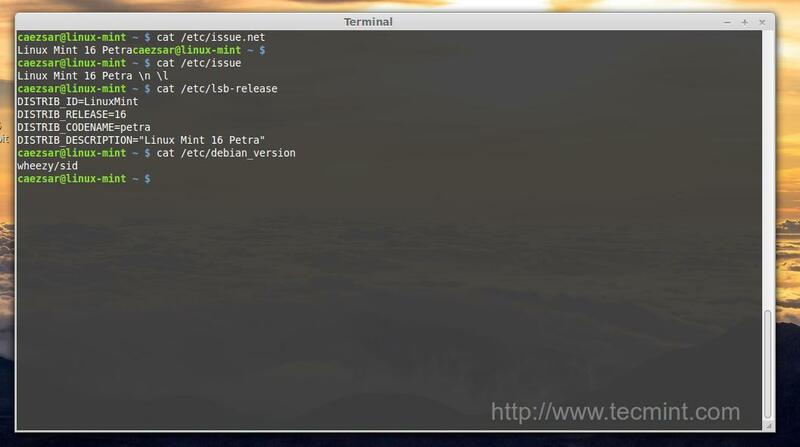 To verify it, open a terminal and run the commands from the beginning of this tutorial. 8. 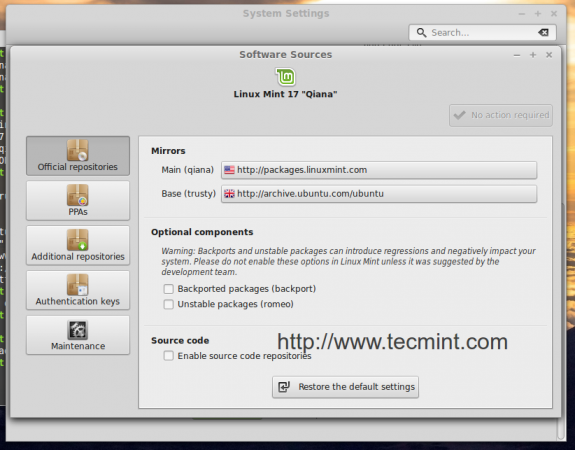 You can also run Linux Mint System Settings and open Software Sources and System Info to confirm your latest version. According to Distrowatch website Linux Mint is the most downloaded Linux distribution from 2011 so far with more than 3700 hits on last six months, thanks to its multiple Desktop Managers (Cinnamon, MATE – Gnome2 fork, KDE and LDME version), to the fact that it focuses on Desktop platforms, outrunning by far its distro sources like Ubuntu and Debian. Thank you for this gold peace of HowTo! So easy and not so much to know about Linux. Now my old mashine will run for a wile. 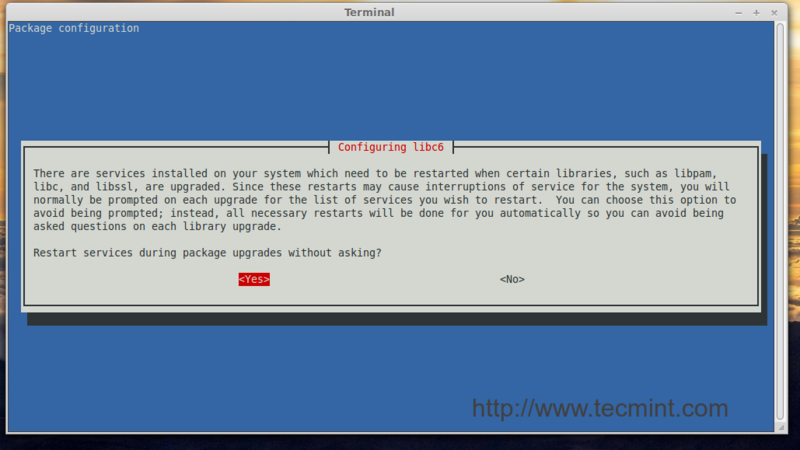 I was able to successfully upgrade to Linux Mint 17 from 16 through aptitude safe-upgrade command. Is this right? This is the most detailed article Ive seen about migrating to a new OS. I started building mint17.1-KDE and got it to point I was having fun with it. I was considering mingrating it over to my Petra machine when suddenly the unthinkable happened and my HD-died. It started with a simple chkdsk error and progressed from there. I had made an image of my Petra disk so I wasn’t worried. Later I tried to restore it using my archive image and my disk-flash-image. Neither of whiched worked out because as soon as I run update the system tells me that the Ubuntu-saucy archives are NOT reachable. Can anyone tell me whom is the keeper of the Petra-archives? 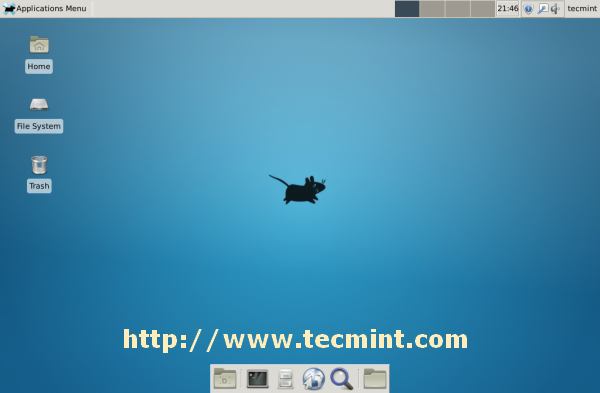 I’ve been forced over to run solely on mint17.1-kde and it is just too buggy to use as a primary machine. Werid things happen on Mint17.1 like browsers falling over, connection to remote disk failing, network popping in and out. I just want my Petra-back. wheres the Archives cos I didn’t know about backing up sources before reading this. Just for your information, I was using mint mate petra/saucy KDE and used this guide to update to Quiana, all went well until reboot. 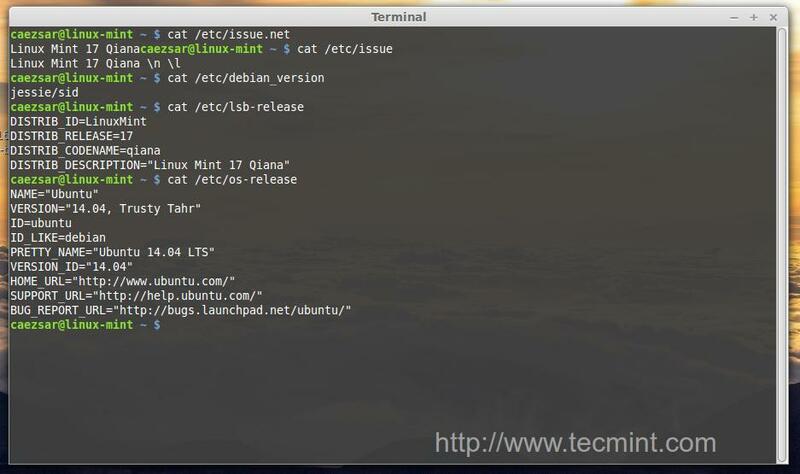 Just prior to reboot; issue, issue.net, etc showed the new Ubuntu / Mint versions. After reboot, startkde could not be found. 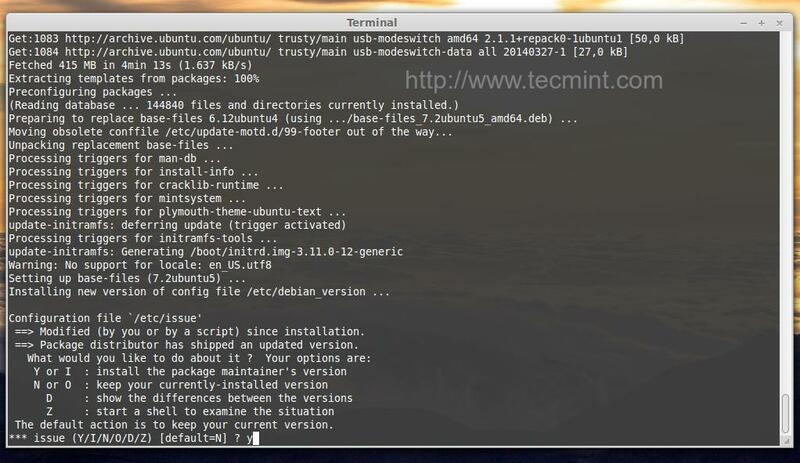 After installing and using apt-file from the root terminal (in safe mode with networking) I installed the missing startkde file but too much was missing and cluttered in KDE so I decided to just install the latest mint using the USB (mintstick).